Drivers get Porsches. Investors get cut off. While the best sports cars in its lineup can certainly compete with the Prancing Horse’s finest, Porsche is no Ferrari and it’s damn proud of it too. Ferrari has no qualms with owners who’d rather let their rides be museum quality garage queens for the duration of their long lives, but thankfully Porsche doesn’t share that sentiment, at least according to what Porsche’s head of GT road car development, Andreas Preuninger, said to Car and Driver. Instead, he’d rather see them on the road. No comment on what he thinks about the rare 911 GT2 that sold for $1.45 million at auction, but his comments are better taken in reference to the 911 R. When it first went on sale, collectors snagged up the limited edition super coupe and soon some were back on dealership lots fetching over $1 million. Now that Porsche is offering a manual in the 911 GT3, prices for the 911 R are dropping and some customers who who bought in at the peak are pissed. What does Preuninger think? He could care less. “When I said we’re not a hedge fund, I’m talking to those people who are yelling at us for offering the manual transmission similar to the R,” he said. Even though there’s a demand for those kinds of cars, which Porsche is investigating further, the company would rather sell to the real enthusiasts for the time being. Preuninger’s strategy for making this happen lies simply in not selling to supercar flippers. “If you’re flipping cars, then I think it’s understandable that you won’t get on the list for the next car if we have more demand than supply,” Preuninger said. “It’s not a punishment but a strategy: to supply the cars to the customers who will really use them. 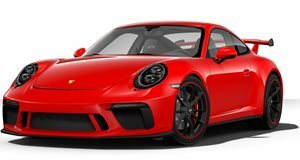 I think that’s just fair.” To be fair to Ferrari, Porsche is the only automaker of the two that has SUVs in its lineup, but at least Preuninger will keep those out of the GT family. Stay true, Preuninger.